DRAYCOTE WATER AND BRANDON MARSH. I soon turned grumpy in the car park when I had to cough up £2.50 but cheered up a bit just as I approached the meter when a women said I could have her ticket for a quid.Headed for the new children's play area to see if I could see any Redwings.Soon spotted a few in a tree and managed a couple of so so shots before I scared them off. That turned out to be the highlight of the trip because having had a good look round the sailing club area and a walk down to as far as the Spit I saw absolutely nothing at all.No sign of the Red Breasted Merganser.I gave up then and headed over to Brandon Marsh. My grumpy mood stayed with me all the way to Brandon but was soon sent packing when I was put onto a cracking Grey Wagtail and a Pied Wagtail which were catching insects in the sun on the Centre roof. Did no good at the EM and Carlton hides with both being very quiet although the Carlton hide pool is now full of water.Had a bit of luck in the Baldwin hide on the way back when a female Goldeneye came fairly close to the hide.Blew the whites out as usual !!! Just before leaving I had a go at checking out the berry bushes near the coach park to see if any Redwings were there.There were a few but a devil to get close to. At this time of year unless something decent has been reported elsewhere I go out with the camera to my nearest local patch Marsh Lane.It's only 10 minutes away. Monday lunchtime the weather showed signs of brightening up so I grabbed the camera and went over there.I headed straight to the Oak hide and met up with Jeff Rankin who was watching a Common Gull at the back of one of the islands.It had settled down in a hollow for ages and then suddenly started to flap it's wings which was when we noticed it had a badly damaged leg.Fearing the worse for it we were both surprised and pleased when it managed to take flight and fly off. 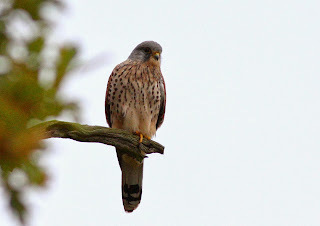 The weather had not brightened up in fact it had become pretty gloomy so rubbish for getting decent shots.I was lucky when heading for the car park the Kestrel showed in one of the oak trees and I managed some shots in the gloom. Before leaving I had a quick look in the car park hide and soon spotted a Little Egret.It didn't stay long and flew off to land in a distant tree.Too gloomy for decent shots but nice to see. I was just about to get in the car when I noticed the Kestrel had returned and had landed in the other oak tree.The walk of about 100m from the hide to this tree is all in the open so you cannot get close however I've been told you've got a better chance if you cover your face when approaching.I've no idea if this was complete bull or not but I tried it by holding my gloved hands in front of my face.No one was more surprised than me when I managed to get pretty close.What a pity the light was so poor. Went to Brandon Marsh Saturday morning for the first time in a few weeks.Sometime ago I'd decided to give Brandon a miss unless something good was reported but my subs were due so off I went.Got there just before 10.00 AM to find a bright but frosty morning. Paid my subs and headed first to the Wright hide.Pretty soon I spotted a Yellow Legged Gull amongst the other Gulls. With nothing else about I headed to the Baldwin hide where juvenile and adult male Goldeneyes were on view.As usual I managed to blow out the whites but nice to see. Nothing else was seen till I got to the Carlton hide where I got my first Redwing shots of the year. A very poor shot as it was on Willow island which is out of my range but a Redshank was a very unusual spot this time of year.I'd never seen one so late in the year before. After a cup of tea in the cafe which is not the same after the stunning waitress left earlier in the year I left and headed home to get warm. 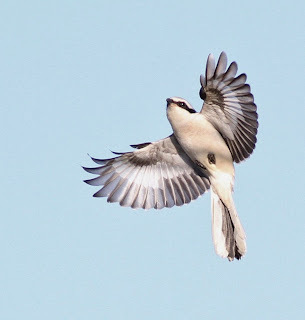 Went to Marsh Lane again Friday morning but had no luck and never used the camera once.So I thought I'd do some more backtracking and post some shots taken in recent years of some local birds. In March 2013 we were very lucky at Marsh Lane when up to four Jack Snipes showed in the marsh next to the Oak hide.Quite often one came pretty close to the hide.Here are a couple of shots one showing a Common and a Jack next to each other. On the 26th April of this year I had just parked up at Brandon Marsh when a text told me "31 Black-tailed Godwits in front of Oak hide at Marsh Lane".I of course raced over there fingers crossed that they were still there.Luckily they were and I was able to get some of my best shots of these chaps. I'd never seen a Lesser Scaup before so I was chuffed to get this shot of one that stayed for a few days in Toft at Draycote Water in March 2011.Mind you I needed help to pick it out amongst the Tufties. I'd seen Lesser Spotted Woodpeckers before but all my shots had been taken at distance and were pretty grim.In October 2009 one started to show at Whitacre Heath in the cut down reeds in front of one of the hides.Mind you you had to be very patient as it didn't appear very often. In September 2009 a friend and I were walking along Farborough bank when we spotted a very dark bird about 30 metres out on the water.We didn't have a clue what it was but being pro's (Ha Ha) we immediately rattled off some shots as it flew off.It wasn't till later that we found out it was a Manx Shearwater. I'd been on a trip to Norfolk in September 2009 and at Cley I'd failed to get even a half decent shot of a Pectoral Sandpiper that was there.It would not come close.When I got home I received a text that there was one at Draycote Water so the next day I shot over there fingers crossed that it was still there.It was.It favoured a beach area just past the Spit on the Farborough bank.It took no notice of all the birders watching it from the footpath wall.Great bird. 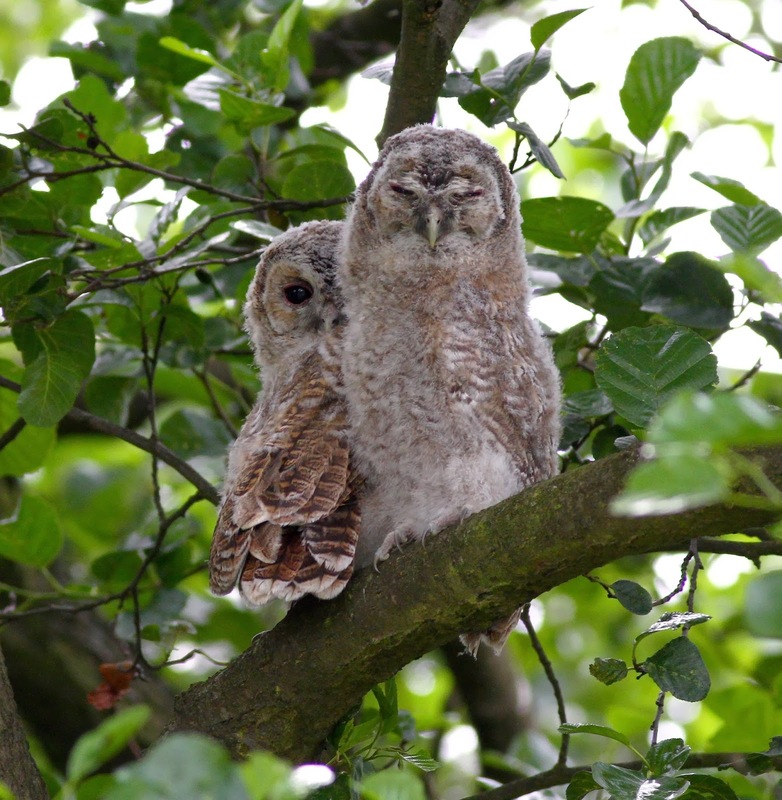 In 2011 an Owl box not far from the Oak hide along the stream line was occupied by a pair of Tawny Owls.Didn't get any shots of the adults but stumbled upon these juveniles in June.It was great surprise when I spotted them. I'm having a very bad run recently getting some decent birding pics so I had my fingers crossed Thursday lunchtime when I went to my local patch Marsh Lane hoping the easterly winds had blown something in. It turned out to be a pretty frustrating couple of hours in the bright but very chilly conditions.Went straight to the Oak hide to see if the Jack Snipe was showing.It wasn't. There were very few birds on the Railway pool due I'm sure to railway workers cutting down bushes on the embankment.What birds that were there shot off when a Sparrowhawk flew over.It landed in the tree next to the feeders but annoyingly showed only fleetingly so no shots despite it being fairly close.Did get a shot of a lone Shellduck and a Pochard but both in tricky light. Things got even more frustrating in the Car Park hide where a Peregrine sat in a distant tree for ages and did nothing.When it finally flew off it off course went the other way and not where the food was on the islands in front of the hide.What a miserable so and so.This is all I could manage with my lens.You can just make out it's a Peregrine if you can spot it in the shot that is !!!! So the bad run with the camera continues. OUT IN THE BITTER COLD. Having stayed in over the weekend and despite the very cold weather I braved the conditions Monday lunchtime and headed over to my closest local patch Marsh Lane.I had put loads of layers on because at my age if your thermals are penetrated by the cold the result could be fatal. Only one other birder had braved the conditions and we met up in the Oak hide.Tony also had found nothing decent so far which probably caused us to try and turn this Gull into something special but eventually we decided it was a first winter Herring Gull. The only other bird I pointed the camera at was the Kestrel that sometimes can be seen hunting from the car park.Didn't do so well this time with the shots as he was often against the bright sunshine. Lasted nearly two hours in the cold before racing home to get warm.Pretty pathetic really as it is yet to get really cold. Weather very poor and still no decent birds reported locally so I've done some more backtracking sorting out good birds I've photographed locally. This cracking looking Black-necked Grebe was at Napton Res. for a while in September 2009.Often it showed with the light behind it but on occasions it went to the southern end of the reservoir and shots could be taken. Firecrests are cracking birds but are very rare and when you are lucky enough to get onto one they ping around a lot just like their cousins Goldcrests.This is a shot of one of two that was at Alvecote pools down a very dingy lane in February 2008. It took me ages to finally get to see a Great Grey Shrike so I was very pleased to see this chap that was at Napton on the Hill near the old quarry workings in November 2010. Draycote Water was my favourite local patch in the Winter despite it often being bitterly cold most of the time but they used to get some cracking birds there.I say used to because the last couple of Winters it has been pretty poor.It used to get a few Great Northern Divers there every year but not lately.This shot was taken in November 2008. Grey Phalaropes are great birds because they are usually very accommodating and are happy to come close.This one was at Shustoke Res. in September 2008 and was not at all bothered by the numerous photographers rattling off shots. I'd seen a Green Winged Teal before when one showed fairly well at Draycote Water a few years ago in Toft but it was still a surprise to find one on the River Pool at Brandon Marsh in March 2013.The light was horrendous with dazzling reflections off the water preventing you seeing the bird let alone getting shots.I was lucky to get this shot when it for once came close. Waxwings are cracking birds and however many shots you've already got you still want to race out and get some more when they turn up.A decent sized flock showed well in some trees in Meriden by the A45 overpass in January 2011. In October 2011 I received a text that a Spoonbill had been reported at Draycote Water.Not believing this I sent a text to Bob Hazell who is always at Draycote in the mornings.He text back and said he hadn't seen one and then phoned back soon after to say there was one near the outfall.I raced over there and joined the crowd of birders by the outfall.